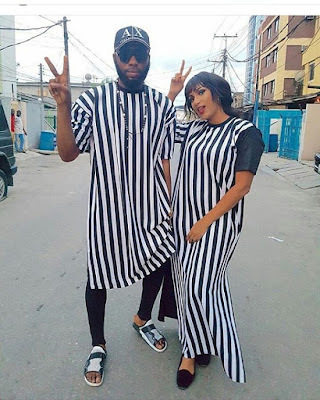 Ghanaian screen goddess, Juliet Ibrahim and multi award winning celebrity stylist, Jeremiah Ogbodo popularly recognized as Swanky Jerry of Swanky Signatures. They were pictured rocking the stylist's innovated monochrome dress which can be worn by both men or women. They look more like a cute couple rocking matching outfits, what do you think?